Microscope World Blog: What is a Microscope Eyepiece Reticle? 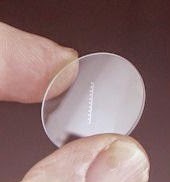 Microscope eyepiece reticles are small circular disks that have a ruler, grid or some other measuring format printed on them that can be inserted into a microscope eyepiece. When you look through the eyepiece once the reticle is installed, the ruler or grid is imposed upon your microscopy image. Not all microscope eyepieces are fitted to accept a reticle. In order to figure out if yours does, follow these instructions. Remove your eyepiece from the microscope and look into the bottom of it. 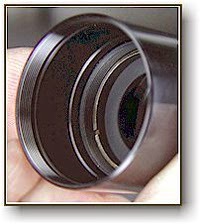 If your eyepiece accepts a measuring reticle, you will see a retaining ring that can be removed. 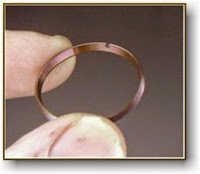 If you see a retaining ring, go ahead and remove the ring. You will then want to measure (in mm) the diameter of the glass reticle that the eyepiece will hold. This is an important measurement as many eyepiece reticles are custom printed and can not be returned. Keep in mind that if you measure the retaining ring diameter, this may be 1mm larger than the size reticle requierd, as the glass reticle must be able to drop onto the shelf in the eyepiece, while the retaining ring will simply hold it in place. Microscope eyepiece reticle sizes are anywhere from 16mm - 28mm in diameter. Once you know that your microscope eyepiece can accept a reticle, now it is time to determine what type will best suit your needs. The most common types of reticles are ruler reticles, crossline reticles and grid reticles. For basic measurement a ruler reticle will work well. The magnification of the eyepiece itself has no affect on the reticle divisions you will view. For example, if your ruler reticle is 10mm with 100 divisions, your reticle division is 10 ÷ 100 = 0.1mm. When using the 4x objective to make measurements with the above mentioned reticle, your distance between lines when measuring is: 0.1mm ÷ 4 = 0.025mm. When using that same reticle with the 100x objective lens the distance between lines is 0.1mm ÷ 100 = 0.001mm. Many specialized microscope reticles are available including comparator reticles, grain sizing reticles and concentric circles. Once you have purchased your reticle, you will want to calibrate your microscope. Learn more about calibrating your microscope here.